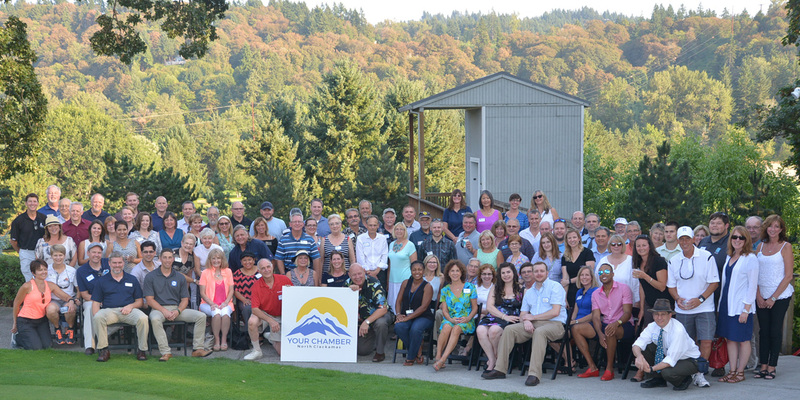 Last month we celebrated the North Clackamas Chamber of Commerce 60th Anniversary at the Sah-Hah-Lee Golf Course & Driving Range which is nestled up against the banks of the beautiful Clackamas River. This serene setting added a magical touch to the already memorable occasion and our team had a wonderful time enjoying thought-provoking conversations with other Chamber of Commerce members. One of our favorite parts of the celebration, other than great people enjoying delicious food, was the unveiling of the new North Clackamas Chamber of Commerce logo and mobile-friendly website. The new logo was inspired by the majestic mountains that surround our region in the glow of the rising sun; appropriate symbols used to represent the “bright new future” of the entire business community. Although change can sometimes be difficult, our team thinks that the talented people at the chamber who worked on this behind the scenes and everyone else involved did an amazing job. The new logo (designed by Stilo Designs) and website (designed by Ashworth Consulting) reveal was one of the most exciting moments of the event. Our experience working with long-time chamber members has been great and those experiences were the deciding factor that lead us to join. We love the community minded approach they practice and the diverse group of businesses that participate. Total Market Exposure has been part of other chamber groups before, but we believe the North Clackamas Chamber of Commerce offers something special. If you have been looking for a motivated network of business professionals with countless opportunities, we highly recommend you consider joining the North Clackamas Chamber of Commerce. It’s the perfect place to get noticed, get involved, and get acquainted.